These Chips were thin and greasy and crumbled as soon as we started crunching into them. They were very light and crispy. There are certain companies that make it a little strange for you to review their Chips. The flavors are one thing, but these are Utz Original. 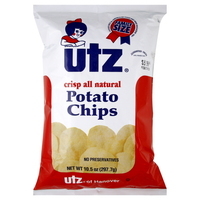 Utz are one of the oldest and most established Chips manufacturers in the world. To review their Original Chips is to review, The Chip! Quite rightly, these Chips were average in every way. Not very thick, not too thin. Not too much bubbling, but a few broken bubbles. Not much visible seasoning, but enough. They were oily. A Nose Plunge Test revealed a warm sort of empty bag. We had to take a look inside. Phew, there were Chips. What followed was a sandwich partner. To eat these Chips on their own would be to deny yourself a trip into the Wonderful World of Potato Chips and Crisps. There are many flavors out there; Utz make a few of them. These tasted of oily potato.